Far from the moribund picture sometimes painted about the current state of manufacturing across the globe, the industry is in the midst of a technological growth spurt that is transforming the industry’s systems and processes. It’s this transformation and the technologies that are driving it that give customers more say than ever before in how their products will look and perform. Renaissance is the word used by consulting company PwC’s Strategy& to describe that growth. Advancements in the manufacturing and product design processes throughout the past five years have given companies the capability to customize their parts and products and then to order those parts in small or large runs straight from the manufacturer. Also today, the information returned by the Internet of Things allows companies to design their products around the feedback they receive from models already being used in the field. The IoT brings together internet connectivity, sensor technology, cloud computing, and other hardware, software, and data analysis systems to offer up-to-the-minute information about how a product performs. Those products are able to capture all sorts of information about their own operation and their surrounding environment and feed it back to owners for analysis that yields vital information, including maintenance needs and schedules, and ideal operating environments. And then there’s Industry 4.0, which is the trend toward automation and data exchange in manufacturing technologies. This includes cyber-physical systems, the IoT, and cloud computing. Industry 4.0 enables products and manufacturing systems and products to include excellent technical documentation that allows the rapid execution of cyber decisions. But the story of the manufacturing technology that truly empowers customers by giving them an ongoing say in product design and performance comes from the world of additive manufacturing. Additive manufacturing has made for the quick prototyping and testing of a physical design, it has allowed designers to iterate quickly and speed their products’ time to market, and it has enabled them to make design changes on the fly. Whether they need a small, thin-walled part, a part with complex geometries, or a large, durable prototype, companies can have an additive manufactured part or set of parts made quickly and at a lower cost than through conventional manufacturing methods. And made to their standards. Part design can be changed on the fly, too. The company just needs to alert the additive manufacturer to the change and the next part run will include the newly changed design. Because of its very nature, printed parts can take any shape a company desires. They don’t need to adhere to the lines and curves of the traditionally manufactured parts. For parts with very intricate geometries or curved surfaces that can’t be created through molding or machining, printing is a natural choice. It’s options like this—inclusive of all company stakeholders, from everyday engineers to executives—that drive companies to be more competitive and profitable in the long run. When a company’s employees, executives, and its customers have a say in how the final product will look, act, and perform, the company’s profile and profits are set to grow. What’s more, parts created through the additive manufacturing process can today be used as part of even very large and complex assemblies. And in industries that must attain the pinnacle of safety. Airbus, for instance, turned to parts made on Stratasys printers for its Airbus A350 XWB aircraft, delivered in December 2014. The company knew the printed parts could slash part-production time and manufacturing costs while producing strong, lightweight parts that meet stringent safety specifications for its aircraft. And that has proven to be the case. Stratasys’ printers have already produced more than 1,000 parts for the aircraft. The Airbus parts are printed with Stratasys’ ULTEM™ 9085 resin, which is certified to Airbus material specification. The material boasts a high strength-to-weight ratio and is flame, smoke, and toxicity compliance for aircraft flight parts. Because they’re printed, rather than machined and manufactured, part production time is slashed. The parts produced on Stratasys machines weigh 30–55% less than traditionally manufactured parts, reduce raw material used by 90%, and cut total energy used in production by up to 90% compared to traditional methods, says Peter Sander of Airbus’s Innovation Cell. The production has reduced the total weight on each aircraft by up to one ton. By 2018, Airbus expects to print about 30 tons of metal parts every month. Similarly produced components are also included within in-service jetliners in the A300/A310 family. 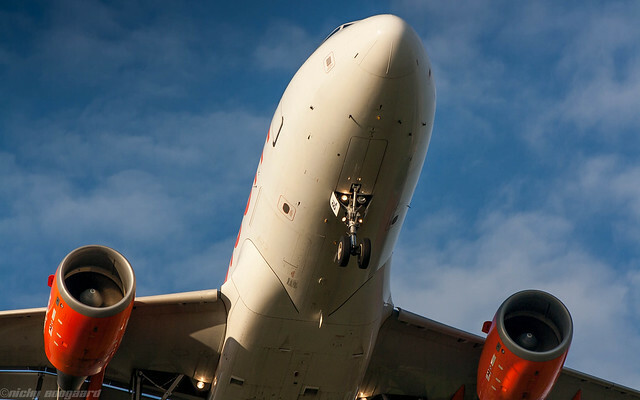 The airline industry itself is making the move to additive manufacturing process because the printing method delivers absolutely consistent results. Parts are identical and meet very stringent specifications. The same goes for the materials used to make the parts. As that example illustrates, it’s a new world for manufacturers and for the companies—and consumers—that depend on them. As the industry prepares to gather at the Paris Airshow next month, be sure to stop by our booth to see the ways that we are continuing to support aviation manufacturers in their efforts to build the factory of the future.